Globe Telecom and Optical Media Board conduct an information dissemination campaign against piracy at Palawan National School. “Today’s youth consume content mostly online and most of them find nothing wrong about downloading and streaming through torrent sites and illegal streaming devices (ISDs). Such a widespread mindset will hurt not just the Philippine entertainment industry but will also affect thousands of livelihood,” said Yoly Crisanto, Globe Chief Sustainability Officer and Senior Vice-President for Corporate Communications. “This shows the urgent need to inform young people about what is legal and what is not in a fast-developing online world. Not to mention the considerable dangers and risks around cybersafety when accessing illegal sites. As a leader of Filipino digital lifestyle, it is important that we do what we can, alongside with all stakeholders, to help foster greater awareness of piracy and legal alternatives for consumers,” Crisanto added. 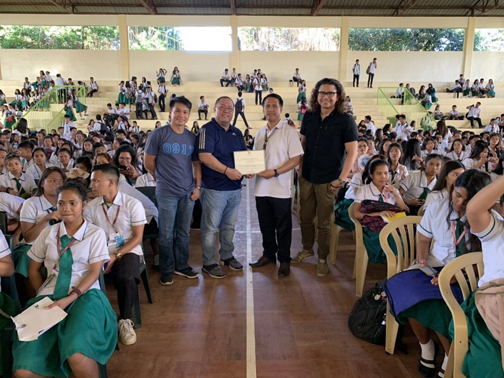 Globe and OMB recently conducted a schoolwide information campaign in Puerto Princesa, Palawan to discuss the perils of engaging in movie, TV or music piracy. One of the issues tackled was how accessing content through illegal means, like ISDs, exposes viewers to various threats such as viruses and malware that can steal private information. The OMB, together with Globe, also held an intellectual property debate among students from Ateneo Law School and San Beda Law School. With these initiatives, the OMB gave Globe Telecom The Kalis (a sword used by tribes) Award at the recent OMB VIP Appreciation Night for their joint crusade against piracy. Latest from Alexa data analysis showed streaming pirated content online soared by 75 percent between 2016 and 2017. The Philippines alone has a total of 22 million visits to infringing websites in 2017, data from Alexa showed. Organizations like the Film Development Council of the Philippines (FDCP) and the Coalition Against Piracy (CAP) have also expressed support for #PlayItRight. Globe has also joined the Asia Video Industry Association (AVIA) to strengthen its mandate in fighting piracy across Asia through effective enforcement and disruption of intermediaries in the piracy chain. Visit https://www1.globe.com.ph/play-it-righthttps://www1.globe.com.ph/play-it-right to learn more about the anti-piracy advocacy.